This is a great dress. It will need to be shortened unless you are almost six feet tall, but the material is very pretty and out of what was taken off the bottom a shoulder wrap was made. 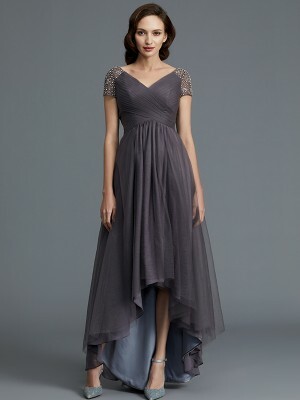 Ordered this dress for one of my bridesmaids. Colour is great and it fits really well. The white trim can easily be removed. The dress is really gorgeous, it looks even better than in the picture!!! I got my dress on time and when they said it would arrive. I really love the dress. I had to have the shoulder straps adjusted and the front of the dress gaped a bit so had to be sown up a bit. And there is something funky about the lining. It moves and show's a bit down the bottom. But it isn't a big deal and only I notice it. I really love the dress and had lots of comments. I got it in Burgundy and in a size 12. I think it is a really flattering style. I have already ordered another dress form this site and really love that one too. Looking forward to my next dress.